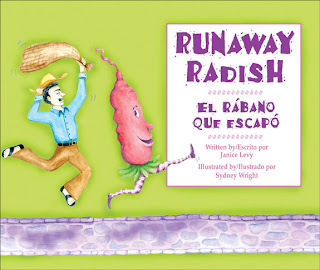 "Runaway Radish" is a story similar to "The Gingerbread Man". The story is about the Radish Festival held yearly in Oaxaca, Mexico. Just as the carver was about to finish carving his radish sculpture, the last radish ran away. It is a delightful children's story. The bright, colorful illustrations are very animated and thus appealing to children. Now no review regarding any children's book would be complete without a glimpse of what its target audience, a child, thinks. As a result, I had all three of my children read and review "Runaway Radish". All of them liked "Runaway Radish", especially my six year old son. My oldest, nine, thought the book was kinda cheesy (her words), but liked the Spanish on each page. She liked trying to figure out what each word was. After a mini-Spanish lesson from mom, she was much more successful. The vocabulary list in the back is also very helpful for children. I loved the story. The history regarding the origination of the story helps the reader understand the setting for the story. I know that what is included on the dust-jacket of a hardcover is not always also included on a soft-cover. I hope they keep this information, though, as it is very useful. Without this background, the reader might wonder why the main character was displaying radishes as he was. It would still be a good story, but is even better with this touch of reality "thrown" in. I also loved the English/Spanish on each page. As a homeschooling mom who loves literature-based and "real-life" learning, I see this as a great tool. Anyone can memorize a set of letters, words, or conjugation rules. But nothing helps one truly grasp a language like seeing it used in a "real" story. It brings the language to life like no textbook ever could. I imagine it would do the same for ESL students. "Runaway Radish" is a cheerful, fun story that is also educational. I would recommend this book to homeschooling parents desiring to teach their children Spanish as well as to the "traditional" Spanish or ESL student.